...he convened a series of “conferences” with business leaders urging them to maintain wages and employment through the months to come. Hoover’s overriding commitment in all his years in government was to prize cooperation over coercion, and jawboning corporate leaders was part of that commitment. Better economists than I are saying President Carter is going to have to start jawboning if he wants to Stop inflation. All very well for a President who can jawbone like a champion, but veteran jawbone writers doubt that Mr. Carter has what it takes. The NBC Nightly News showed films the other night comparing President Carter's jawboning with President Kennedy's. One film showed Mr. Kennedy jawboning the steel industry about a price increase in 1962, and the other showed Mr. Carter jawboning the steel industry about a price increase last Wednesday. All you could say after watching the Kennedy performance was, “They don't make jawboners like that any more.” What Caruso was to opera, what Babe Ruth was to bats, Jack Kennedy was to jawboning. By comparison, Jimmy Carter sounded like a hambone the steel tycoons might toss into the soup. So, from Baker's point of view, JFK was really good at the practice of jawboning, which in the early 1960s involved persuading steel industry executives to forego price increases. Baker reasoned, as others did at the time, that Carter should start talking inflation down, presumably by convincing producers to forego price increases. ...it is not possible to do the job [disination] without effective wage and price controls of some kind...there could be worse prospects, and probably they include determined but unassisted monetary disinflation. Here, Tobin's not discussing jawboning, otherwise known as moral suasion, but outright wage and price controls. He's saying you can't bring inflation down ("it is not possible") through monetary policy alone. But Paul Volcker proved Tobin wrong by engineering an unexpectedly rapid disinflation in the United States. That, more than anything I think, convinced everyone that we should make clear that inflation control is a job for the central bank, and to hold central bankers to account if they don't do a good job. It may come as a surprise to you (and I missed this myself when it first made the news) that Prime Minister Abe of Japan is attempting jawbone-inflation-control.This story from last December indicates that, in contrast to disinflationary jawboning, Abe wants everyone to increase nominal wages at 3% per year, so as to increase inflation. The reasoning seems to be that, if productivity is going up at a rate of 1% per year, then 3% nominal wage growth will cause firms to increase prices at about 2% per year, and the Bank of Japan will then be achieving its inflation target. Since early 2013, the Bank of Japan has had an explicit 2% inflation target, and has tried everything that a conventional central banker might try to get inflation to go up - including policies once thought "unconventional." The BOJ has kept short-term interest rates low - even going into negative territory - and has expanded its balance sheet massively through large-scale asset purchases. It has even pegged the 10-year government bond rate to zero. All to no avail, apparently, as the chart shows no sign of a sustained inflation developing. The American experience since 1996 is indeed a mild, sustained inflation, and the CPI path is not far from a 2% inflation path for the whole 22-year period. Surprisingly, the Fed didn't actually have an explicit 2% inflation target until 2012, but I don't think the US inflation performance is an accident. It seems reasonable to infer that the FOMC was implicitly following a 2% target. Maybe he's just being polite, but the worst interpretation of Kuroda's comments is that he's abandoning responsibility for his inflation target. 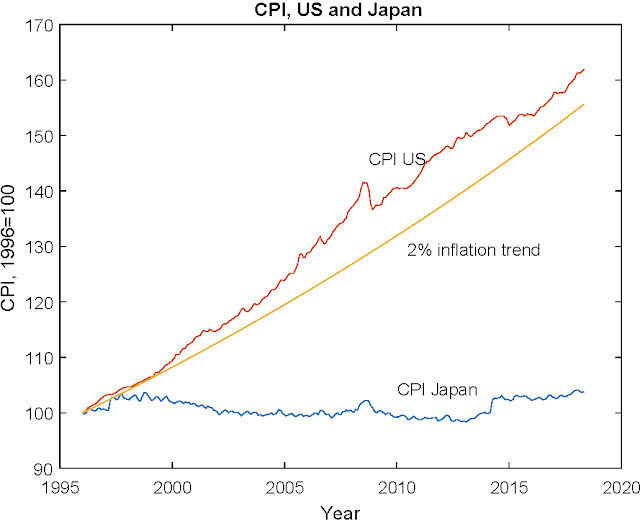 Maybe he's willing to think that inflation results from a self-sustaining wage-price spiral, and if inflation stays low, and the BOJ falls short of its 2% inflation target, then that's the fault of the people who set the prices and wages. But who knows? In any case, when central bankers can't do what they claim to be able to do - control inflation - you can see how all hell can break lose. 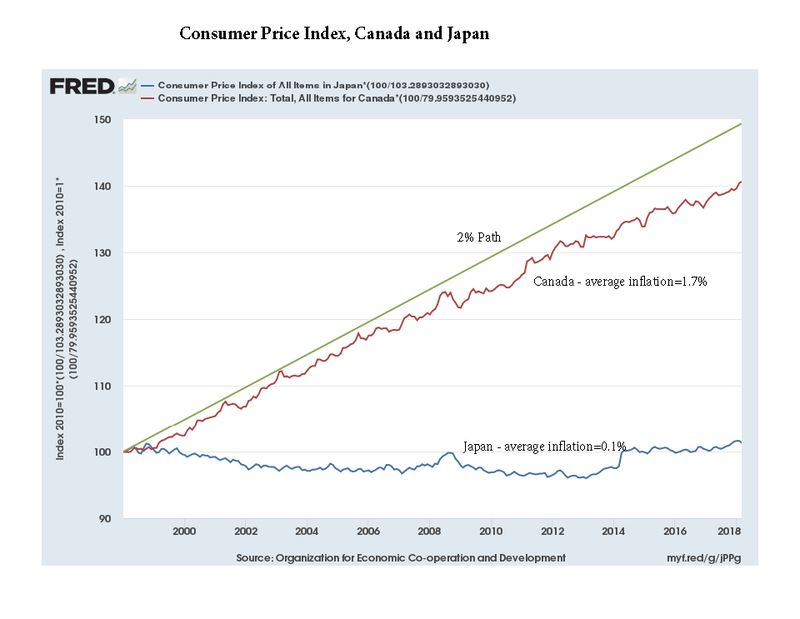 Before we know it, Japan could have wage and price controls, which have a rather sorry history, including the Anti-Inflation Board (1975-1979) in Canada. I hate to repeat myself, but what the heck. Monetarism works as an approach to disinflation. Reducing the rate of growth in total central bank liabilities in a sustained fashion has to reduce inflation. Unfortunately, increasing the rate of growth in central bank liabilities is not a sufficient condition for inflation to increase. A necessary and sufficient condition for inflation to increase in a sustained fashion is a permanent increase in short-term nominal interest rates. Balance sheet expansion with the interest rate on reserves kept low will increase central bank liabilities alright, but will not increase inflation - this just amounts to a swap of interest bearing (albeit at low or negative interest rates) central bank reserves for other interest-bearing assets (or even ETFs, in the BOJ case), and can't doing anything to create a sustained inflation. That's more than obvious from Japanese experience. The BOJ can't increase inflation by staying the course (more quantitative easing, continued low or negative interest rates). It has to increase its policy rate - nothing more complicated than that - and sustaining that increase in the policy rate will induce higher inflation. Easy. I'm puzzled by the infatuation with NGDP targeting. We have good reasons to care about the path for the price level and the path for real GDP. Idea seems to be that if you smooth Py that you get optimal paths for P and y. That's hardly obvious, and doesn't fall out of any serious theory I'm aware of. The proximate cause of that outburst was this blog post by David Beckworth who, as you might know, is a proponent of nominal GDP (NGDP) targeting. I've written before about NGDP targeting - for example I found this post from six years ago. It turns out that not much has changed since then. My views haven't changed, and the promoters of NGDP targeting are more or less the same ones that were around six years ago - and I don't get the sense they've come up with anything new to tell us. In any case, though, I wanted to find out for sure, and that's what my tweet was about. It basically says: "I don't think you have a good argument, but in case you do, please tell me about it." I tried to provoke Beckworth a bit to get an answer out of him, but he just called me a troll. But, at last, some degree of success, as George Selgin has gone to considerable trouble to research the economics literature to come up with what he thinks are "serious" arguments that would support NGDP targeting. The first order of business for George is to complain about my use of the word "serious:"
I'm not exactly sure what Stephen means by a "serious theory." But if he means coherent and thoughtful theoretical arguments by well-respected (and presumably "serious") economists, then there are all sorts of "serious theories" out there to which he might refer, with roots tracing back to the heyday of classical economics. Indeed, until the advent of the Keynesian revolution, a stable nominal GDP ideal, or something close to it, was at least as popular among highly-regarded economists as that of a stable output price level, its chief rival. "Serious" means that a good case has been made, where "good" means a theory with conclusions that follow from reasonable assumptions, and some notion that this works empirically. Good science basically. Unfortunately, in economics there is plenty of bad science to wade through, and some of that bad science finds its way into reputable journals, and is written by economists with fancy titles working at reputable academic and non-academic institutions. That's why I qualified my statement with "serious." I know there's a mountain of economics writing arguing that NGDP targeting is the cat's meow. But anyone could find mountains of writing in economics about any number of crappy ideas. I want to know about the good stuff. And I'm not going to be convinced by the reputations of the people promoting the ideas or the popularity of the ideas. Everyone has to make their case, and we don't do science by opinion poll. So, what's an example of a serious idea, related to monetary policy rules? Well, one of these is Friedman's constant money growth rule. Friedman had a theory to back that up in "The Role of Monetary Policy." That's a coherent theory, but it's all in words. Like many things that Friedman did, you can also formalize it, which is - more or less - what Lucas did. There was also a formidable empirical project, Friedman and Schwartz's Monetary History of the United States, which Friedman used to support the theory. With everything laid out like that, we're able to argue about the assumptions, the conclusions, and the evidence. Serious stuff. Friedman was convincing enough that central banks actually implemented his ideas. Some of that was a success (the Volcker disinflation) and some was not (ongoing inflation control). In the inflation targeting game, that's pretty good. In Canada's case, inflation targeting has proved to be feasible, it's easily understood, it's conducted in a way that promotes central bank independence, and it appears to be compatible with good economic performance in other dimensions. So what's to complain about? I think we can make a case that central banking should be conservative - this isn't a venue where we should treat experimentation lightly. To change procedure we have to think that something's going wrong with the current approach, and that switching gears is highly likely to give us an improvement. In Canada, the Bank reviews its agreement with the government of Canada every 5 years, and thinks about whether it's doing the right thing. The agreement won't be reconsidered until 2021, but the Bank is already mulling this over - a process which involves economic research and consultation with the public. Serious work, I think. 1. McCallum 1987: McCallum was an early promoter of NGDP targeting. From the paper, this looks like some kind of modified monetarism. McCallum won't write a model down. He says we don't have agreement on what the model is, so apparently his policy rule is somehow agnostic. But he goes ahead anyway to run an "atheoretical" regression, and uses the estimated coefficients to simulate the performance of his rule. Yikes. Definitely not serious - a multitude of sins in that one. 2. Garin, Lester, Sims: This starts with a boilerplate New Keynesian (NK) model and ultimately expands this into a "medium scale" model. This is complicated enough that's it's not going to be amenable to analysis - pencil and paper techniques. The authors estimate and calibrate the parameters in the model and then evaluate the performance of alternative policy rules, according to the welfare loss relative to what would occur in an identical economy with flexible wages and flexible prices. So, this is serious work. There's a model that is formally laid out, there are references to the related literature, there is an attempt to measure the welfare effects of alternative policy rules given the model at hand. The authors report, in Table 7, that the welfare loss for NGDP targeting is .11% of GDP, from inflation targeting .86%, from output gap targeting .03%, and from a Taylor rule .24%. So, if we were living in this model NK world, then the best we could do is to target the output gap. This of course makes perfect sense, since the output gap is the deviation of output from output in the flexible wage/price equilibrium, so the welfare criterion is in fact the output gap. And NGDP targeting is second best, and certainly much better than pure inflation targeting or a Taylor rule. But, once we're past the actual exercise at hand we can start to ask questions. What's the model leaving out that might be germane to the problem at hand? What else could we do with this model that might lead us to different conclusions? First, the model has sticky-price and sticky-wage frictions, but we know there are other frictions of importance for monetary policy - financial frictions in particular. Surely we don't think that this NK model will tell us anything about what to do in a financial crisis, for example. I might like to know what would happen under a naive policy. That's a little difficult here as we have to worry about determinacy issues, but indeterminacy isn't stopping most NK modelers. They typically ignore the global indeterminacy that's staring them in the face. The naive policy would be a useful benchmark, as this would give us a measure of how costly price and wage stickiness is. My guess is the welfare loss in these models is very small - not enough to justify the cost of running the Fed, I think. The big difficulty here, I think, is indeterminacy. In simple NK models - Benhabib et al. for example - we know that a Taylor rule central banker can get stuck at the zero lower bound. The alternative policy rules considered in the paper are, as the authors argue, alternative Taylor rules - set the nominal interest rate with a particular target in mind, and alternative coefficients. For NGDP targeting, in the model the central bank sets the nominal interest rate each period to peg NGDP to a constant. I would like to know exactly what sort of rule that produces, and I would like to know about the global properties of the model - not just an approximation around the steady state. The indeterminacy issue is important, as "Taylor rule perils" can explain why some central banks have had trouble hitting inflation targets (the Bank of Japan in particular). NGDP targets aren't going to do any better if they are subject to the same perils - a problem not addressed in the paper. So, the jury is out on Garin-Lester-Sims. 3. Sheedy 2014: What I like about this paper is that it takes nominal intertemporal contracts seriously. My suspicion is that NK people are barking up the wrong tree in emphasizing potential inefficiencies in nominal spot market contracts (and it's not like labor contracts are typically spot contracts anyway). Debt contracts at, for example, 3-month, 1-year, 10-year, or 20-year horizons are subject to inflation risk for those horizons. So, if the central bank can make prices predictable over long horizons, that should reduce risk in credit markets substantially, and should make those markets work more efficiently. But in Sheedy's model, smoothing nominal income is apparently a good way to insure against this uninsured risk. And Sheedy's model is quite special. Indeed, it's addressing a monetary policy issue in a 3-period model - that's not a serious approach to monetary economics in my opinion. It's hard to model valued central bank liabilities in a sensible way in a finite horizon model. My guess is that, if you developed this idea in a serious monetary model, that an optimal policy rule might look like price level targeting. Someone would have to do the work though. Conclusion? Well, some seriousness alright, but I still don't see NGDP targeting "falling out of any serious theory." I'm not yet ready to tell any central bankers (in case they're asking) that they should drop their inflation targets and adopt NGDP targeting.